More than two-thirds of Australian marketers investing in content marketing tactics plan to increase the amount of budget spent on these activities in the next year, a new report claims. The new Content Marketing in Australia: 2014 Benchmarks, Budgets and Trendsreport from the Content Marketing Institute (CMI) and Association for Data-driven Marketing and Advertising (ADMA) found 93 per cent of Australian organisations are using content marketing today, with 81 per cent producing more content than they did just one year ago. Top reasons cited include brand awareness, engagement, and lead generation. Just shy of three-quarters of respondents (74 per cent) said they had a staff member in place to oversee their content marketing strategy. The report was based on a survey of 159 Australian organisations across July and August. 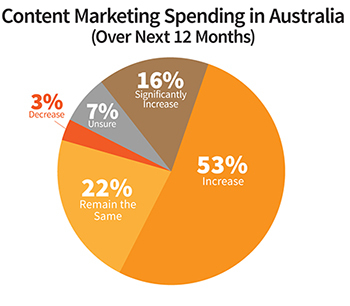 Most notably, 69 per cent of Australian marketers plan to increase the amount of budget they allocate to content marketing activities in the next 12 months. This compared with 58 per cent of US marketers and 56 per cent of UK marketers surveyed separately by CMI. CMI founder, Joe Pulizzi, pointed out its global research showed Australian marketers were increasing their content output at a higher rate than their US and UK counterparts. 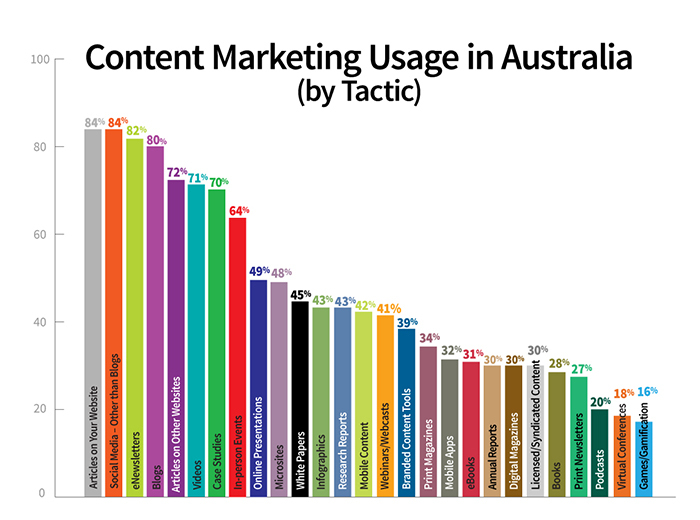 “Content marketing has clearly taken hold in Australia, with 52 per cent of respondents saying they have a documented content marketing strategy, which is around 10 per cent higher than in North America and the UK,” he commented. What’s interesting though is that Australian marketers are less assured of themselves than their UK and US colleagues when it comes to overall effectiveness. Just 33 per cent rated themselves as either ‘very effective’ or ‘effective’, compared with 41 per cent in the US and 48 per cent in the UK. The top three content marketing tactics are articles on their corporate website (84 per cent), social media excluding blogs (84 per cent), and e-newsletters (80 per cent). Least popular are podcasts (20 per cent), virtual conferences (18 per cent) and gamification (16 per cent). E-newsletters proved the most effective method for Australian marketers (73 per cent), followed by in-person events (66 per cent) and research reports (63 per cent). In contrast, US and UK marketers rated in-person events more effective, while e-newsletters were less (63 per cent of US respondents and 66 per cent of UK respondents respectively). “The fact that 69 per cent of Australian marketers plan to increase the amount of budget they allocate to content marketing indicates they are beginning to see how content marketing can benefit clients, consumers and the bottom line,” added ADMA CEO, Jodie Sangster. When it comes to the hurdles, 44 per cent of respondents in Australia admitted they were challenged with producing enough content, and 41 per cent find producing engaging content to be a challenge. Thirty-eight per cent are also challenged by a lack of budget. King Content CEO, Craig Hodges, has experienced the surge in interest around content marketing first-hand, and said clients were investing in both content strategies as well as content for their owned assets and social platforms. “We’ve also seen the growth of Linkedin as our clients look to amplify the content they are developing,” he told CMO.